Read on to find out about why women in Nepal are at a disadvantage from the day they are born – first of three blogs that will examine and express the nature of disempowerment for women in Nepal, beginning with religious beliefs. I have had many interesting travel experiences since arriving in Nepal. From road rage to goats being all the rage, commuting from place to place has been anything but ordinary…. Visiting a remote village of Nepal, I was brought out into the middle of endless rice fields. Objective: to learn about what life is like for Nepali women in the Terai region and speak with some of the survivors of uterine prolapse. Before running any type of interactive teaching activity, you always ask yourself… “Will it work? Political rally for women’s rights in the constitution… watch out, here come the ladies! 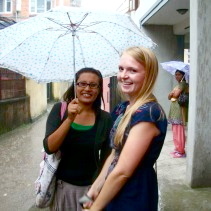 Arrival in Kathmandu: a wedding, a search for a flat, and getting lost… in a nutshell.